Anyone enjoy the film from which this game is based on? If so, good… don’t buy the game; it comes down to something which is somewhat depressing when a game needs to be condemned in the opening sentence of its review but after well over a decade of poor film tie-ins it seems that developers still haven’t learned a single thing about how to actually make one that’s actually you know… decent, playable or even remotely enjoyable. So where to start? With the story I guess to get it out of the way, the Earth has been abandoned by the entire human race due to excessive amounts of waste that they have created and all that’s been left behind are a load of Waste Allocation Load Lifter Earth-Class robots (Wall-Es) which have been tasked with cleaning it all up so that it might one day become habitable once more. Following on a few centuries and only one robot remains, Wall-E who carries out his job alone to the best of his abilities until one fateful day a ship lands on earth from which the robot known as Eve who has been tasked with finding life on Earth emerges from inside. Wall-E then falls in love with Eve, she finds out that he has found out what she has been looking for and so returns to space, Wall-E then chases after her and discovers that there is much more to life than the sheltered shell of an existence he’s been living up until that point. 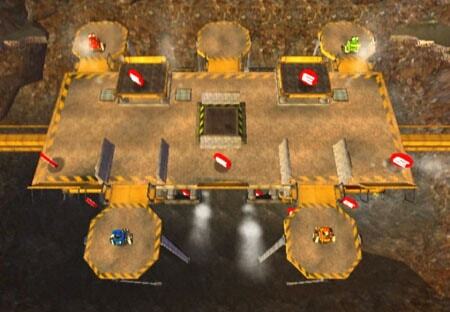 Back to reality and in the game you take control of Wall-E as you navigate hazardous environments moving around and jumping over various obstacles; you are also able to manufacture cubes from different vending stations, these cubes are used to solve a lot of the games “puzzles” and come in standard, heavy, magnetised and explosive varieties. Using those blocks will open up different pathways to Wall-E but it’s his ability to transform himself into a cube which creates the games main gimmick. Sadly as clever as this may sound, it’s so poorly implemented that it detracts from the actual gameplayrather than enhancing it as it should; while you are in this form you are completely at the whim of the environment rather than having control over your character, it’s sad really because when you lose the ability of control in a platform game there isn’t a lot left to hold things together. Conversely when you get to control Eve, everything “flows” a lot more as she can fly and thus isn’t limited to the ground; this provides a much more satisfying experience, couple that with her laser firing and carrying abilities, controlling Wall-E seems noticeably poor in comparison. Add to the already “exciting” mix of flawed control where the main character is concerned and generic tasks there is the catastrophic camera which often leads you into the path of certain doom making obstacles even more of a chore to attempt to ignore. So what else is left? Well the game looks mostly mundane and uninteresting throughout not to mention the textures which imply that the surface is slippy or rough but then react in exactly the opposite way to which you’d expect when you move across the textured area; the sound isn’t too bad and manages to capture the essence of the film but it’s otherwise bland and repetitive. There are certain triangular areas throughout the game which falls under something called the “Tumbler” system where Wall-E can interact with it by performing certain actions (tacked on “waggle” yay!) and if you execute them correctly then you’ll unlock things such as concept art or costumes for the multiplayer mode. Yes how could I forget to mention the marvelous multiplayer mode which is so good that it makes up for the rest of terrible game. It doesn’t really, in fact it’s even worse if that’s possible as it just falls into the realm of a needlessly tacked on extra that barely lasts all of a couple of plays; it basically comprises of matches or co-op sections not related to the single player game in any way and basically just poorly thought out. For me to recommend this game to anyone other than maybe kids who have seen the movie would be pointless, especially seeing as it will only last them a couple of hours where the enjoyment level soon turns into frustration and annoyance. Maybe one to buy cheaply or rent but like the numerous other trashy film to game cash-ins it’s really just not worth it even if you’re a die-hard fan of the movie. While Wall-E’s graphics are very basic and the gameplay as generic as it can get; I strangely had fun while playing the game. The cuteness and the charm from the movies some how remains intact and there were moments that showed promise. For instance in one of the first levels when he has to roll through a tube with holes in it and gets flung out at the other end. That hit me by surprise and kept me playing for a while longer as I’d started to have fun! I loved how when you left Wall-E alone he would move his eyes up and down and look around, that was a good touch. 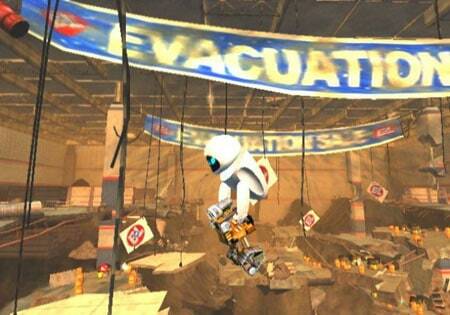 All in all this game is pretty much on the same level as most movie tie in games, I would avoid unless you are particularly infatuated with Wall-E and love him saying his own name as sadly when he says that as you load up the game is the most fun part of it.